Boneset stimulates the immune response and is best used during the secondary phases of colds and flu (ie. swelling of mucus membranes and yellow phlegm). Using this herb speeds the resolution of infections and supports rapid convalescence. The specific indications are upper respiratory infection, especially if accompanied by aches and pains. This includes: chronic cough, pneumonia and fevers. Boneset is also bitter and gently laxative, thereby improving the appetite and assisting in digestion. The classic anti-flu combination is boneset, echinacea and wild indigo (Richo Cech). Using the leaf and flowering tops without the stem, make a tincture of the fresh or dried herb. Make a cold infusion of the dried herb. 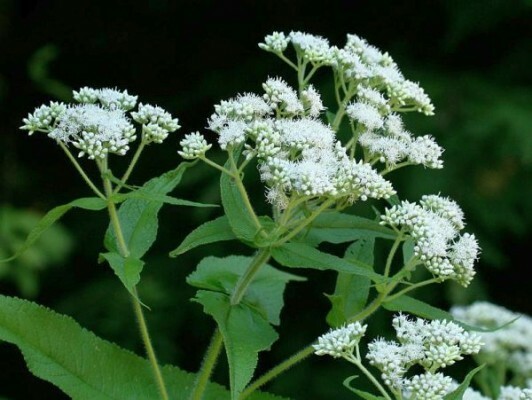 From Chris Marano: Boneset is useful in fever management: as a febrifuge to reduce fever in small cold doses (1-2 oz tea, 5-10 drops tincture in cool water) or as a diaphoretic in larger, hot doses (4-6 oz hot tea, 20-30 drops tincture in hot water). Cautions/Contraindications: This is a strong herb that should be used only when needed. Excessive dosage will cause purging. Boneset is related to gravel root which contains potentially liver damaging alkaloids. Reports on the presence or absence of those alkaloids in boneset are ambigious. For this reason, it is prudent to avoid boneset during pregnancy or in the presence of a liver disease.